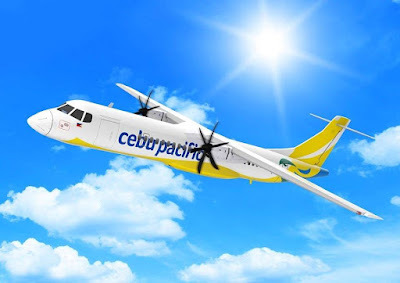 Aviation Updates Philippines - The Philippines' leading airline, Cebu Pacific Air (PSE:CEB), ordered 16 ATR 72-600 from ATR, the European Turboprop aircraft manufacturer. At the Paris Air Show, Cebu Pacific and ATR announced that the order includes options to acquire an additional 10 ATR 72-600, valuing the total aircraft order at US$673 million, based on current list prices. The transaction will see Cebu Pacific double its turboprop fleet size, subject to the execution of final purchase documentation. Cebu Pacific ATR 72-600 with the airline's new livery. The order is part of Cebu Pacific's fleet renewal program. Cebu Pacific currently operates a fleet of eight ATR 72-500 aircraft, which will be retired as the new aircraft enter service. The entry into service of the ATR 72-600 will see Cebu Pacific with new generation aircraft to meet growing demand in the Philippines for inter-island services. Patrick de Castelbajac, Chief Executive Officer of ATR, declares to be "very happy to continue our partnership with one of the leading airlines in South-East Asia and to contribute to the expansion of its network throughout the islands of the archipelago. Cebu Pacific will also be able to benefit from the vast support network for ATR operators in Asia. When their first ATR 72-600 arrives, there will be five ATR pilot training centers in the region." *Note: This is an official press release from Cebu Pacific Air. The article solely belongs to the company and its author.